The Indian government has, in the past month of May 2015, taken action against NGOs (non-governmental organisations working for non-commercial purpose) who have failed, according to the government, to account for their foreign funding. Nearly 9,000 NGOs have had their registrations cancelled by the government, i.e., they can no longer operate legally as NGOs. Before this massive issue of orders, the government had also suspended the license of the Indian branch of international environmental activist group Greenpeace; and condemned its activities as anti-national. Ford Foundation, a US-based charity, was also placed on a security watch list at about the same time. This widely covered confrontation between the government and NGOs has raised both questions and concerns. These actions have been taken under the jurisdiction of an act passed by the previous government in 2010, the Foreign Contribution Regulation Act: whose role was just that – to regulate foreign funded NGOs. It suddenly gave Mr. Manmohan Singh’s government the power to regulate 45,000 NGOs; the reason for its passing was the wave of anti-nuclear protests that had swept the country in 2010, against the setting up of atomic power plants. The Congress-led UPA government alleged that these protests had a “foreign hand” behind them; and introduced legislation to control internationally funded NGOs that presented a threat to “Indian sovereignty”. The drive by their successors, to take action on the basis of this law, was initially welcomed: by many including Harsh Jaitli, chief executive of Voluntary Action Network India, since this effort seemed to be motivated by different concerns. He explained that a number of registered NGOs were now “defunct and closed down”, and cancelling them made sense. Some may even be guilty of the government’s primary charge, financial misconduct, regarding their foreign donations. However, he said that concerns arose when genuine NGOs with a history of doing good work were also being given notices; and frustration was felt by the opaque, “hostile” way in which the home ministry was dealing with the NGOs. Similar frustrations were echoed by Greenpeace India board member Pranonjoy Guha Thakurta, whose organization has clashed with the government on several issues over the last year. This, according to many, is the reason they have been included in the list of NGOs that have been sent suspension/cancellation orders for not sending the home ministry accounts of their foreign donations over the last three years. Mr. Thakurta argues that this isn’t true, that Greenpeace has been diligent with its accounting; and that the government has acted in a “unilateral, uncooperative” manner. Most of the organizations have not been named; but the government announced the suspension of Greenpeace’s license with a volley of allegations after all their funds and bank accounts frozen a week before. The government has previously condemned many of Greenpeace’s activities, and accused it of damaging the economy. During that period, another US-based charity, the Ford Foundation, was placed on a security watch-list. The American Ambassador to India, Richard Verma, has criticized this series of actions, saying they could have a “potentially chilling effect”. Earlier this year, certain foreign donors were brought under stricter regulation, and a number of these were Christian charities and Samaritan networks: this has prompted speculations that the list too targets such aid workers. This has been linked with the RSS’ anger against Christian groups and their hidden agendas. While The media has pointed out that the Ford Foundation used to fund activist Teesta Setalvad, who was a prominent voice fighting for justice for the victims of the Gujarat riots of 2002. While these other NGOs are probably at the end of the line if they do not resort to legal action, the Greenpeace story is continuing to develop. It may have begun last year when the organization launched a massive, aggressive campaign against coal mining in the forests of Madhya Pradesh by industrial conglomerate Essar; engaging in radical stunts like rapelling down the Essar headquarters to raise awareness. In January, the government did not allow Greenpeace activist Priya Pillai to board a flight to London where she was going to talk about the issue. After the government suspended its license, Samit Aich, executive director, announced that the organization would also probably have to cease all operations within weeks, due to lack of access to funds. The announcement was followed by a letter of response, signed by Greenpeace employees, saying they would continue to work without salary: even if only till the end of June. Greenpeace also appealed to Delhi High Court, on the grounds that the government was taking action against its non-compliance with laws pertaining to foreign funding; but had also frozen its domestic funds, which account for 60% of its total donations. 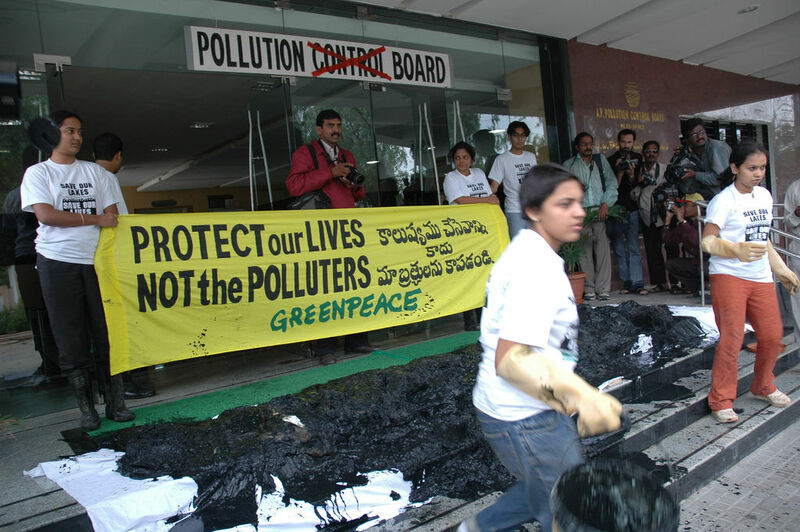 The court has ruled in favour of Greenpeace India, allowing two of its domestic bank accounts to be unfrozen; similar to how the court ruled against the government and allowed Priya Pillai to travel a few months earlier. It is feared that in this clash between government and activists, the focus is being shifted away from doing good. The NGO lobby itself has welcomed deregulation of inoperative organizations; and action against NGOs that are embezzling or misusing money is a sound measure. However, the government’s other reasons: like efforts against foreign interference in domestic affairs, prevention of foreign funding of protests; and the alleged suspicion of Christian organizations are dismissed by many as non-issues. This entire flurry of action against NGOs, a crackdown even, and Mr. Modi’s personal angst against “5-star activists” seems unnecessary, and without reason, to observers. Instead, the war against Greenpeace, and investigation into Ford Foundation strengthen the lobby that believes this government is suppressing dissent. The Banyan blog juxtaposes this crackdown with authoritarian states’ policies against dissenters in China, Kyrgystan, Bangladesh & Sri Lanka. Many hope this similarity is purely incidental.